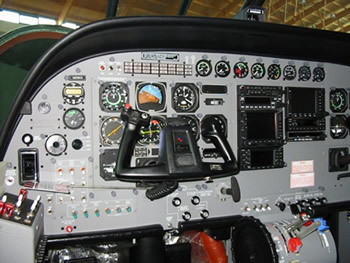 At first sight, the array of dials and switches in an aircraft cockpit can be rather daunting. Unlike automobile drivers, pilots do not have the benefit of direction signs affixed to the sky! As a result, aircraft carry with them some sophisticated navigation equipment that will permit operations even in thick cloud and at night. In addition, as there are no parking areas in the sky, the engine is much better monitored than the average car. Because an aircraft is travelling in three dimensions, additional instruments are required for altitude, and rate of climb and descent. Lastly, pilots need to communicate with airfields and air traffic control. Usually, two radio sets are fitted, (in case of failure) and also a transponder, which is an instrument that transmits to air traffic control so that they can identify you and know your altitude. Sport aircraft have far fewer instrument generally because daylight fine weather operations are all that can be undertaken. Microlights use a simplified cockpit arrangement too, as they also only fly in visual conditions. Nowadays, aircraft panels are rather standardised, so that it is relatively easy for a pilot to make the transition from one aircraft to another.